Fraser was born on July 9, at 12.23pm in Forth Valley Royal Hospital weighing in at 7lb 9.5oz. THE PARENTS: Mum Kimberley (32) is a dental receptionist in Stenhousemuir and dad David (31) is a warehouse worker in Grangemouth. The Glen Village couple have one other child, Abigail (5). 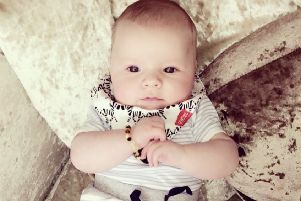 THE BIRTH: Baby Fraser could not wait to meet his family and was born a week and a half early after Kimberley was induced. THE NAME: The couple agreed on the name Fraser five years ago and planned to call Abigail it if she was a boy. The name was agreed on by both parents and they decided it suited their second child.